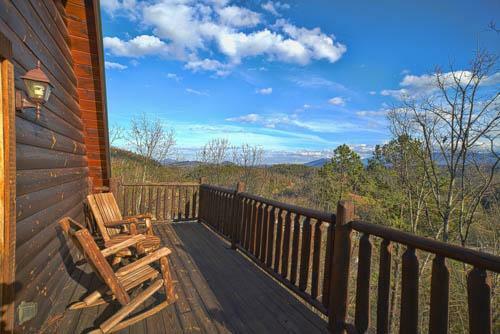 Sunset Cabin is nestled in Pigeon Forge, Tennessee with amazing views of the Smoky Mountains. 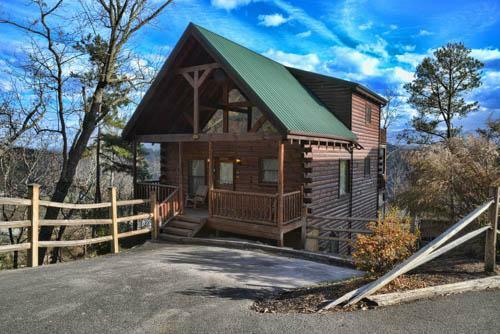 Just 5 miles from Dollywood and the Parkway of Pigeon Forge this 4 bedroom, 3 bathroom luxury cabin offers great views, privacy and all the amenities for a relaxing vacation. 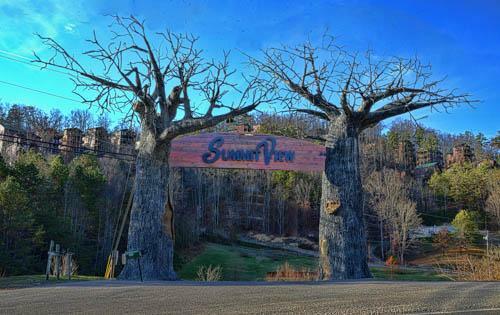 3 decks with great views, a hot tub, game room with pool table and arcade game with 50+ games, TVs in every room including a 50' LCD in the living room above the gas fireplace. The cabin is an easy drive (all paved roads) and offers easy parking for at least 2 cars (have made 4 cars fit). Cabin with a View - Sunset Cabin has everything you need for 12 people including new Whirlpool appliances, dishes, bakeware, etc. Dining room table can seat 10 people (12 with small kids) plus we have a outdoor table available on the middle rear deck. Your next family vacation is just clicks away. The cabin was beautiful and the view was great. 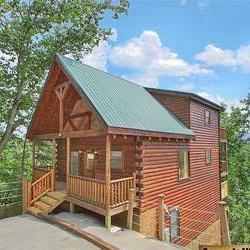 Easily accessible to pigeon forge and Gatlinburg. We enjoyed our stay and the cabin. The owners were very helpful in all aspects and are very easy to co...read more. We had our entire family meet in Pigeon Forge and had a great vacation. 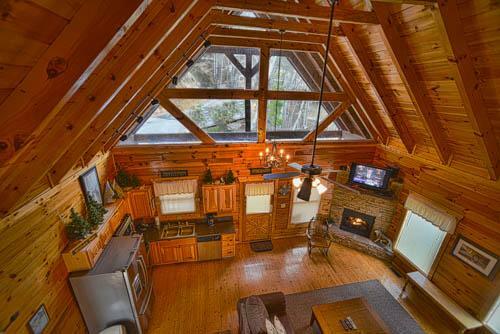 The cabin offered more than enough space for 8 adults and 3 kids. The 3 bathrooms were great for getting ready. The cabin was ve...read more. 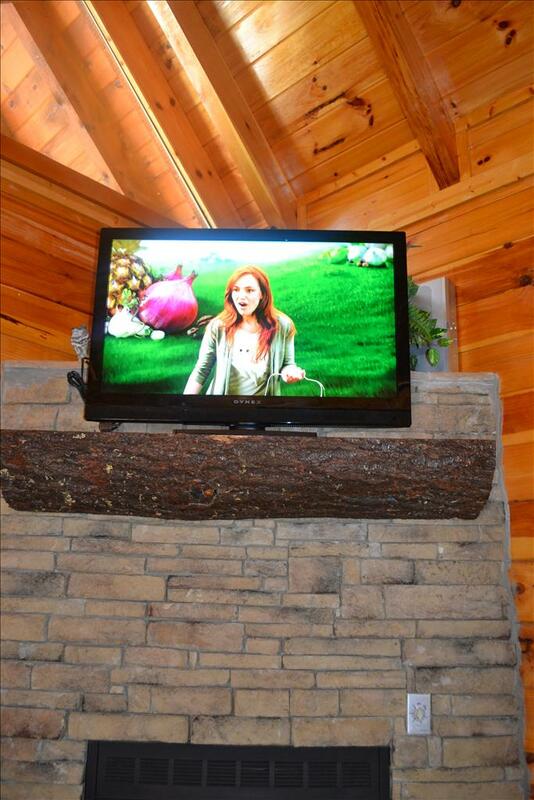 This was the best cabin! Great area for kids to stay entertained while adults just relax and enjoy the views. The only thing that is a little annoying is the trees that provide you with great privacy ...read more. 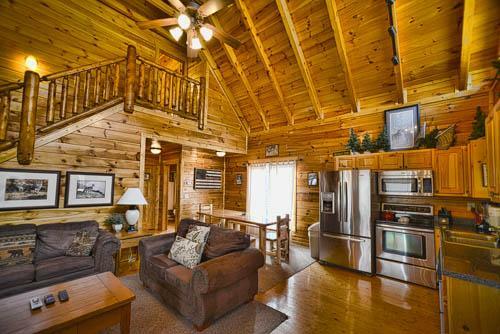 This is a very nice cabin for couples or large families. We spent all day Saturday inside and there was so much to do we never got bored. The only problem we had was some things we needed an instructi...read more. The resort was supplied with everything that we needed, very clean, and was very spacious for our family. 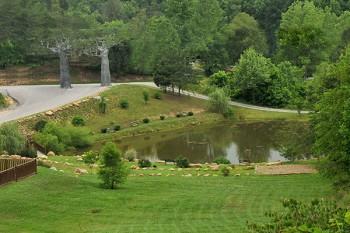 I will be staying here again when I return to Tennessee next year! View Was absolutely amazing...read more. 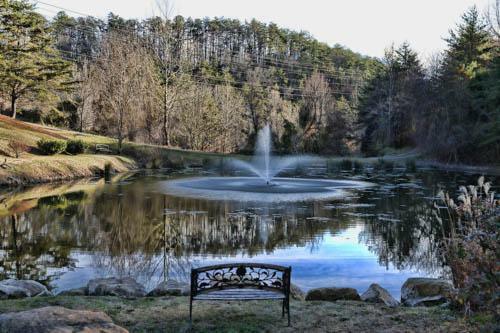 Great location with the best views! Close to everything but once you get on the outside deck you feel miles away from everything. We really enjoyed the game room and hot tub! Looking forward to our ne...read more. We had a wonderful time at the sunset lodge! 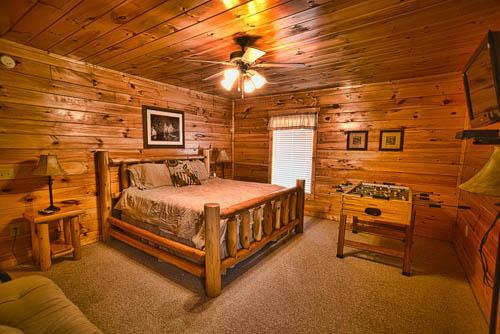 the rooms were great and for the price it exceeded our expectations. Going on vacation on a budget and this made it perfect. There were 12 of us and we all...read more. 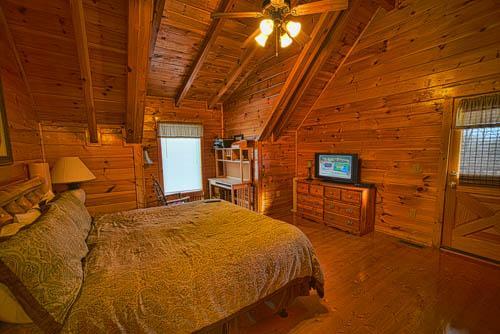 The cabin was terrific and well laid out for multiple families with kids. The location was good and not at the top of the very steep drive. 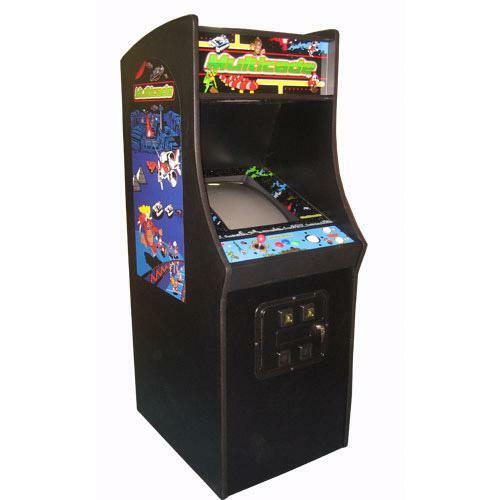 The arcade, pool table, and foosball kept the kids entertain...read more. 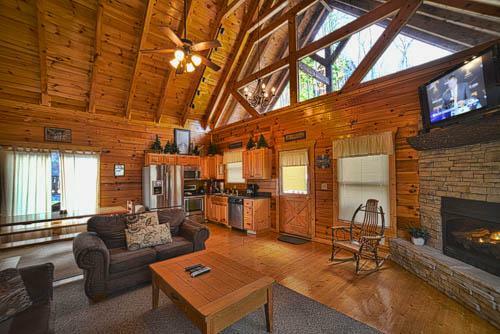 Sunset Cabin offers a spacious open living room with a vaulted ceiling of knotty pine adding to the cabin atmosphere. 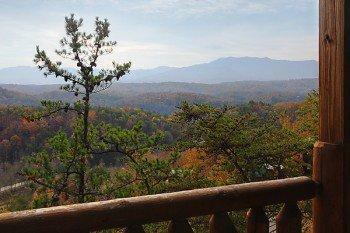 The cabin offers 3 amazing decks with views of the Smokey Mountains unlike any other resort in the area. The living room provides plenty of seating with a large 50" LCD TV, BlueRay Disc Player and a Sleeper Sofa. The kitchen provides all the amenities needed for a good home cooked meal including stainless steel appliances, dishwasher, washer and dryer, pots and pans, silverware, glasses, etc. Our large dining room table made from solid pine offers the perfect setting for a family dinner. Besides breath taking views we offer a game room with a pool table and a full size arcade game with 50 plus favorites already loaded. We also provide darts and a few board games for your use. 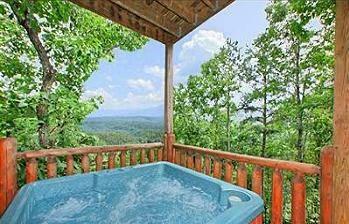 A 6 person hot tub located on the lower deck offers great views with privacy. 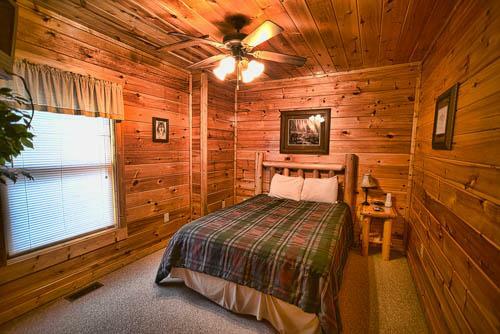 The cabin has 4 bedrooms and 3 full bathrooms with parking for 2 cars (up to 4 cars, if needed). 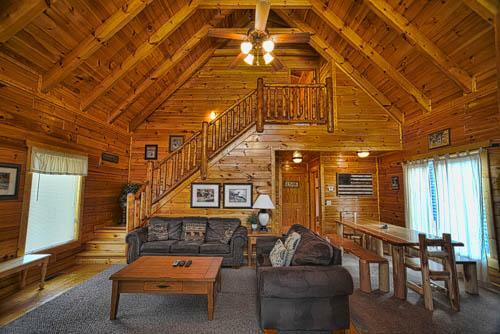 To keep our cabin looking beautiful and to keep you focused on a relaxing we don't require cleaning upon your departure but we do require a $149 cleaning fee per reservation. The cleaning fee will provide a clean cabin upon your arrival with a starter kit of paper towels, toilet paper, hand soap, and dishwasher soap. All linens and towels for bedding and bathrooms. We will NOT provide mid-week refreshments of towels or linens, soaps, or garbage removal. Optional: Pet Cleaning Fee. Limited to DOGS only, less than 25 pounds (limit 2). All reservations require a $250 damage deposit that will be charged to your credit card 3 days prior to check-in. FREE Night with Purchase of 6 stays. 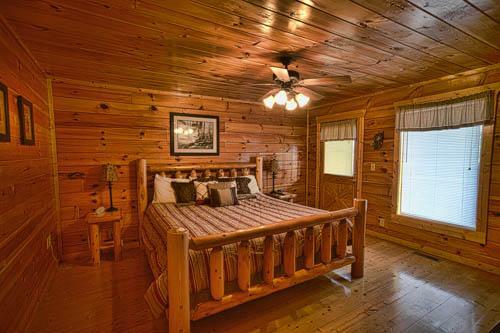 Book now using coupon code #BESTCABIN. Offer expires soon.